When the start of fall arrives and the weather starts to turn from hot to cool, that is when you know it is time to start planning and preparing meals that include Comfort Food. I gathered a handful of bloggers from the Southern Girl Blogging Community and compiled a list of some of the best Southern Comfort Food around. Red Beans and Rice with Sausage – A Woman the World Deserves has created an amazing dish that includes red beans and sausage and healthy vegetables. Cream Cheese Shepherd’s Pie– A Savory Feast has created an amazing cheesy dish that is filled with ground beef and vegetables. Loaded Potato Soup– Little Family Adventure has posted a potato soup recipe that is filled with so much goodness that will warm your tummy. Cheesy Noodle Casserole– Sunshine & Hurricanes has combined noodles, cheese and beef or turkey meat. Healthy Pasta Bake– Happily Hughes combines delicious meat and sweet peppers and spinach. Top Soup Recipes– An Alli Event has compiled a list of her top soup recipes from Pasta e Fagioli to Cream of Cauliflower. Baked Ziti– Hines Sight has a love of pasta and created an awesome dish with ziti and loads of cheese. Oven Baked Smothered Cube Steak– Intelligent Domestications shows you how to make a steak with caramelized onions and gravy. Chicken & Dumplings– House of Fauci’s is sharing her slow cooker recipe that is filled with chicken and vegetables. Vegetable Stew– House of Fauci’s is sharing another slow cooker recipe that is filled with vegetables and meat and is guaranteed to warm your belly. Corn Chowder– Good Girl Gone Redneck has created a slow cooker recipe that can be a side dish or a meal in itself. Crock Pot Mexican Beer Chili– The Crumby Cupcake has paired her favorite beer and ground chili and prepared it in the crock pot. Chicken and Rice Casserole– Arlington Mommy combines chicken, rice and broccoli into a flavorful casserole. Skinny Brunswick Stew– Divas Run for Bling has combined a combination of meat and tomatoes and prepared it in a slow cooker. Veggie Quinoa Chili– Divas Run for Bling is sharing a crock pot recipe that includes quinoa and beans. Rotisserie Chicken– Moms Small Victories shows you how to prepare rotisserie chicken. The ladies of the South are amazing cooks and creators of Southern Comfort Food. From Shepherd’s Pie to Chicken and Dumplings, this compilation of recipes is truly delicious and amazing. There’s nothing quite like some Southern comfort food when the chill hits the air. Especially Chicken & Dumplings – YUM! I am familiar with a few of these recipes. Baked ziti, chicken and dumplings. Oh my, I’m hungry. I’m not from the south but I LOVE sourthern comfort food! Being a southern is so hard on my waistline. When I moved back home after being on the west coast I gained so much weight eating chicken fried steak and white country gravy. Wow so many yummy recipes. My hubby would love these he is a true southern boy. These recipes look good! Can’t wait to start clicking through them all! OMG I am bookmarking this page right now! How delicious, I’m hungry just reading the recipes! Ok so I need everything on this list! EVERYTHING! Loaded baked potato soup sounds perfect for the chilly weather heading our way this weekend. I might make this one first. These are a great collection of recipes. I love to make soups and stews when the weather gets cold. Hmm… my husband likes cube steak every now and again. I think I might try making that smothered one. Awesome collection of comfort foods. I’d love to try the Mexican Chili. After spending most of my life in Oklahoma, it is pretty safe to say that southern style comfort food is my favorite thing. Oh my gosh, I don’t know where to start first. It all looks so feel-good and homey! What a great roundup for dinner ideas! I am so wanting some chicken & dumplings now! I love Southern comfort food. These all sound great for warming you up on a chilly fall night. This comfort food is amazing! I love it for fall and winter. Oh my gosh what a great roundup! Thank you. I will test-drive a few of these! Oh yummy I want to try the chicken and dumplings and the corn chowder. Fatten me up! I love a good Chicken and Dumpling recipe any day. Especially this time of year. There looks like there are quite a few other great recipes here to try out too. Yum! I could eat probably all of it. I love southern food, especially comfort food! Thank you for sharing these recipes now that the weather is getting colder I am always looking for some good comfort food. And you had me at loaded potato soup, my absolute favorite. These all look really good, but my favorite has to be the loaded potato soup, I love that! 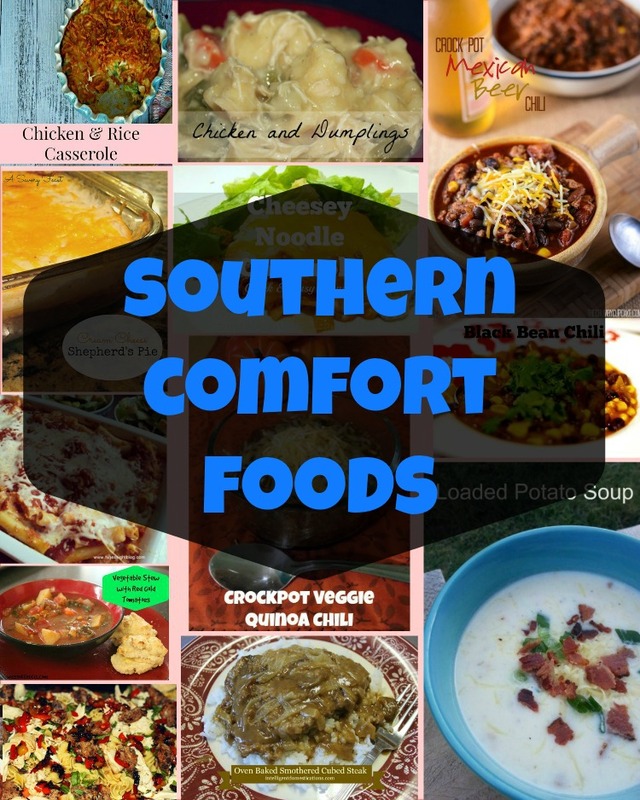 Since I’m from the south, I love our comfort food year round! It’s best in the fall and winter, though. I can’t wait to try out some of these recipes. I don’t think I know anyone who does not love southern food! There is something so comforting about hearty stews, casseroles and soups this time of year. This is a gold mind for a month’s word of food especially for this weather! Thanks Aimee! Mexican Beer chili sounds very interesting and perfect for these chilly fall days! I’ve already pinned a few of these recipes! Wonderful meals! The cream cheese shepherd’s pie sounds very yummy! I see a few I would love to try out. That Red Beans and Rice with Sausage might just be the first one. This was the wrong day for me to wander to your site. OMG, all of these are home runs with me. My mother use to make a delicious chicken and rice dish. I looooove comfort foods. I can’t wait to try some of these! Those SGBG girls sure know how to cook! Thanks for this collection! Pinned it! Comfort food at it’s finest! Looking forward to trying some of these yummy recipes! Yay! A good list of so much recipe I could try! I think I could live off of red beans & rice. I’ve recently been making a sausage and catellini bean stew that is good, too. OMG! That shepherd’s pie sounds AMAZING! Sheppards pie is a favorite around here and I would love to use cream cheeese in it some time. Oh my! These all sound so yummy! Shepherds Pie is one of my faves. Oven baked cube steaks sound really yummy. So many great recipes here. I am interested in trying the auinoa chili. My husband was stationed in North Carolina so I know all about Southern Comfort Food. There is just something so delicious about Southern cooking. What a great collection of recipes. I’m scanning through them and I sure like what I see. I’ll be making some of these soon. I love living in New England, but I LOVVVVVE eating in the South. They have the market on comfort foods. I love baked ziti and make a mean one. I’ve always wanted to learn how to make my own rotisserie chicken though. I’ll have to check out that recipe and a few others.